The Cambridge Satchel Company, a Leicestershire, UK-based leather goods brand and maker of the original satchel bag, raised $21m in funding. Index Ventures made the investment. The company intends to use the funds to further strengthen its management team, recruit specialist digital people, and expand into new markets including China, and the U.S.. 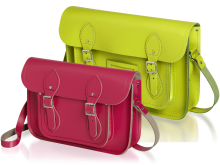 Founded in 2008 by Julie Deane and her mother Freda Thomas, The Cambridge Satchel Company manufactures handmade satchels and leather goods sold in more than 100 countries. The company, which currently has over 100 employees, collaborates with designers and retailers such as Vivienne Westwood, Comme des Garcons, Christopher Shannon and Chris Benz. The bags can be bought online at www.cambridgesatchel.com as well as at their Covent Garden (15 Shorts Gardens, Seven Dials, London, WC2H 9AT) Rose Crescent (17 Rose Crescent, Cambridge, CB2 3LL) and recently opened Spitalfields Pop-Up Store (16 Lamb Street, London, E1 6EA).